WASHINGTON (CNS) — Religious liberty is “the most fundamental freedom in society” and it is at “the very core of the human condition,” attorney and scholar Joseph Weiler told an audience at The Catholic University of America in Washington. He gave a lecture at a ceremony where he was presented an honorary doctorate of theology by the university. In attendance were John Garvey, the university’s president, and several members of its academic faculty at the March 19 event hosted by the School of Theology and Religious Studies. In honoring Weiler, the university cited his lifelong contributions to the cause of religious liberty, scholarship on Judeo-Christian morality in European public life, and the continued development of Catholic-Jewish relations in the Western world. Weiler, born in 1951 in Johannesburg, South Africa, is the Joseph Straus professor of law at New York University. He also is the European Union Jean Monnet chaired professor, co-director of the Jean Monnet Center for International and Regional Economic Law and Justice, and president of the European University Institute, based in Florence, Italy. He is the author of several works relating to law and the European Union. 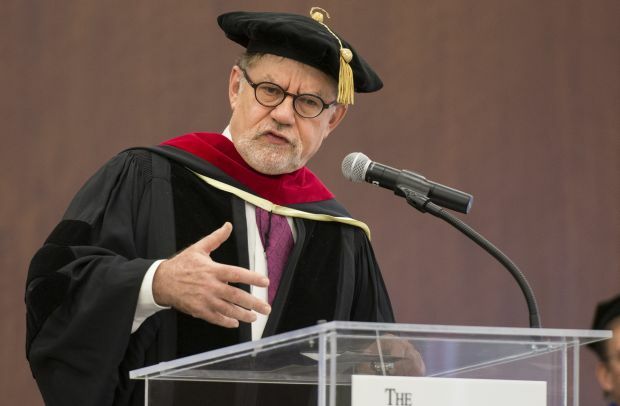 Though he has received many honorary doctorates in his life, Weiler admitted before the ceremony that this one would be his first in theology. Reading his acceptance speech from two worn and tattered index cards, Weiler recalled how the previous morning at the National Gallery of Art he was thinking about what to say. Later, Pope Benedict offered his regret, saying he was “unfortunately misunderstood,” because he was not agreeing with the polemical criticism of Islam. The pope emphasized his “profound respect” for Muslims. His lecture addressed how issues of morality and faith are treated in the modern public square, and particularly in the context of secular democracies. In 2010, the scholar represented, pro bono, eight European countries in an appeal against the European Court of Human Rights edict that barred the display of a crucifix in Italian public schools. The court found that the ban violated the European Convention of Human Rights. In contrast, Weiler also recounted the importance of “freedom from religion,” that is freedom from the coercion of the state in regard to belief. “The proof of the pudding is in eating it,” when it comes to morality for Weiler, who spoke of it in terms relating more to natural law than solitary religious revelation. It is “an act of hubris for the religious person to claim that their morality has a deeper base” than that of common human reason, said Weiler. To explain this, he cited the practices of kosher and halal, which are absent in the Christian faith. Respectively, kosher and halal are dietary laws of the Jewish and Muslim faiths. The latter, he said, is simply “a different type of expression” of faith. In addition to his other titles and accolades, Weiler is also co-director of the Tikvah Center for Law & Jewish Civilization, director of the J.S.D. program of the New York University School of Law and His book “The Constitution of Europe: Do the New Clothes have an Emperor” has been translated into 10 languages.